The first book to use the unexpected discoveries of neuroscience to help us make the best decisions. Since Plato, philosophers have described the decision-making process as either rational or emotional: we carefully deliberate, or we “blink” and go with our gut. But as scientists break open the mind’s black box with the latest tools of neuroscience, they’re discovering that The first book to use the unexpected discoveries of neuroscience to help us make the best decisions. Since Plato, philosophers have described the decision-making process as either rational or emotional: we carefully deliberate, or we “blink” and go with our gut. But as scientists break open the mind’s black box with the latest tools of neuroscience, they’re discovering that this is not how the mind works. Our best decisions are a finely tuned blend of both feeling and reason—and the precise mix depends on the situation. When buying a house, for example, it’s best to let our unconscious mull over the many variables. But when we’re picking a stock, intuition often leads us astray. The trick is to determine when to use the different parts of the brain, and to do this, we need to think harder (and smarter) about how we think. 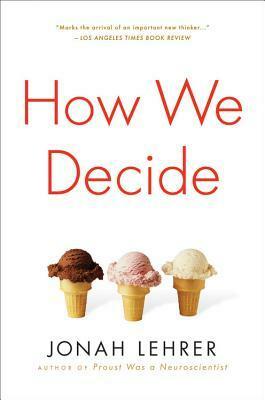 Jonah Lehrer arms us with the tools we need, drawing on cutting-edge research as well as the real-world experiences of a wide range of “deciders”—from airplane pilots and hedge fund investors to serial killers and poker players. Lehrer shows how people are taking advantage of the new science to make better television shows, win more football games, and improve military intelligence. His goal is to answer two questions that are of interest to just about anyone, from CEOs to firefighters: How does the human mind make decisions? And how can we make those decisions better?